Feels like you just got propelled 20 years into the future, with screens blasting advertising and endless expenses of high-rise buildings ? You’re probably in Shanghai. It’s quite a sight to see and the whole worlds knows it, especially the Chinese, as every single attraction is overrun with them. Amidst the metal and glass monuments to modernity, old towns converted to souvenirs shopping malls, temples with exits through the gift shop can be found and in between, it’s endless rows of stores. Then again, I’m not even sure what is labelled as old really is as I was told on a couple occasions that the Chinese have the habit of demolishing whatever piece of their history still subsist and rebuilding copies with recent materials and techniques. I visited a few museums, parks and attractions, but knew from the get go that I would only enjoy Shanghai through aimless wander around. 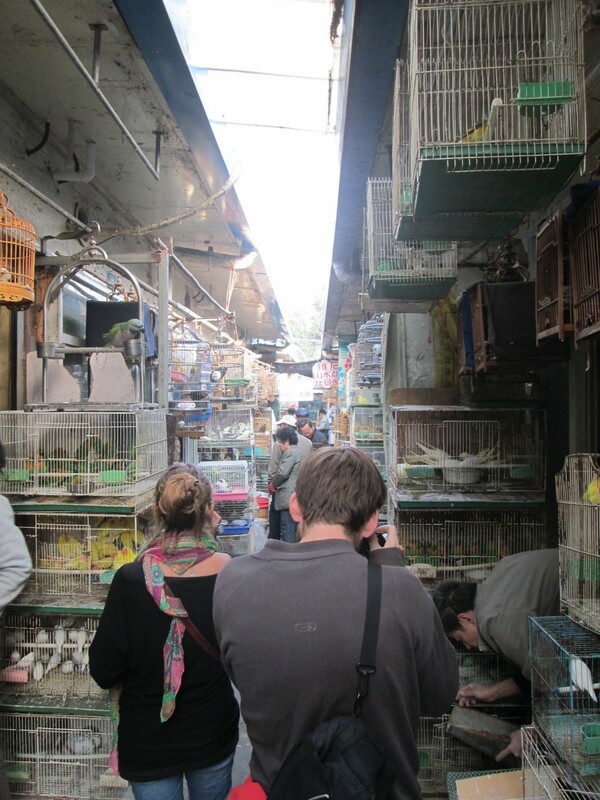 On a quest to find where the Chinese actually lived, walk for hours on end aroung the city I did. I ate at small food stalls, sat on benches with grandmothers doing tai chi around me, found real markets and overall I think got a decent introduction to a culture that is vastly different than mine. After a couple days, No longer expecting anything picturesque in Shanghai proper, I was suggested I could get my fix a short train ride away in Suzhou, nicknamed the “Venice of the east”. 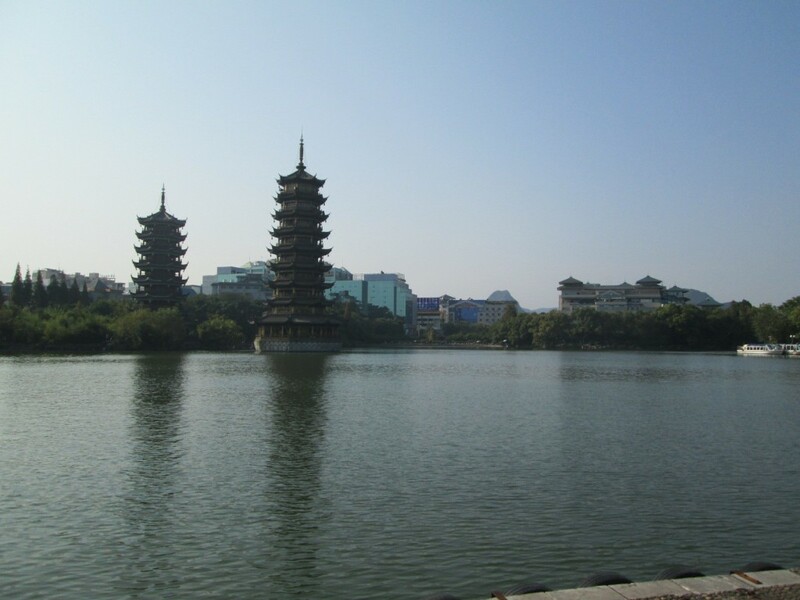 An old canal town with vintage oriental architecture and parks, this “small” (about a million of population) city is charming in every sense of the term. I’m not certain how much of the original Suzhou remains, but walking around it’s waterways and streets sure is a refreshing break from it’s giant neighbor. After this “village” tough, it felt like I exhausted the region of it’s immediate touristic possibilities. 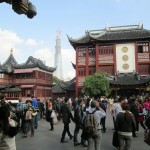 I’m still wondering how the Lonely Planet came to compare Shanghai with Paris. On my very first hour walking around the city, I was accosted by two English speaking Chinese “student” ladies who wanted, after a couple minutes conversing, offered me to follow them to a Chinese tea ceremony. Feeling an opportunity to mingle with the locals, I readily accepted and got taken to a small secluded room where we were allowed to try out many kinds of tea. 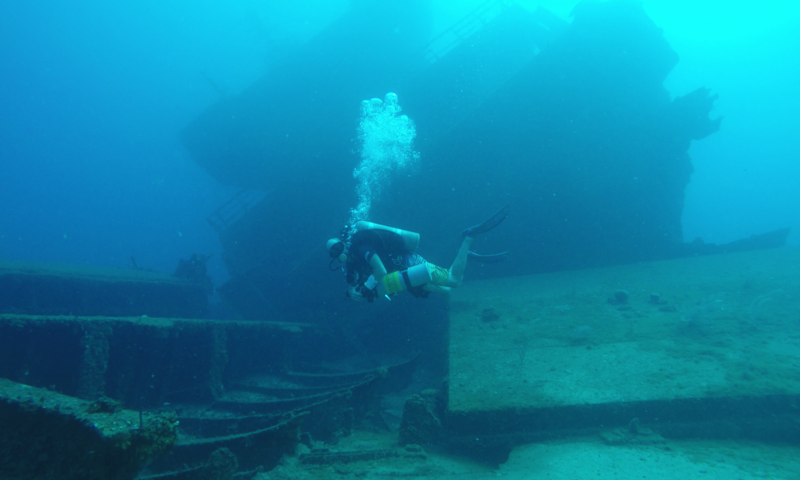 The whole experience was overall pretty pleasurable, until I was given the bill: 50 US$. Then it settled in: I had been scammed. 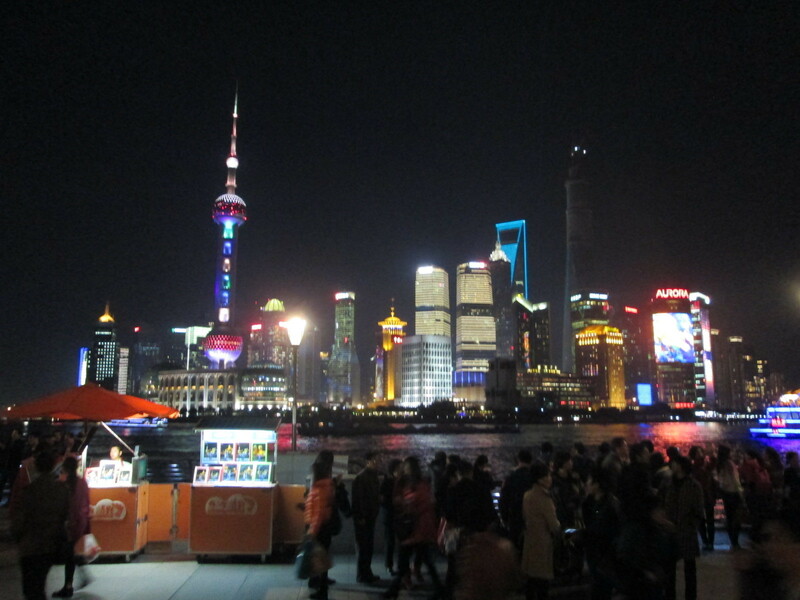 To my credit, I was tired, impressionable, had no idea on the cost of things in Shanghai and had not gotten the briefing given by all hostels on that classic extortion trick and consequently very vulnerable. Whatever, I took out my wallet an spewed some bills without complaining (in retrospect, I should have). A pretty hefty tourist tax, and all I got was a small Chinese pendant with some bells on it that I hung on my backpack, hoping that the small omnipresent ringing would remind me to keep watch in the future. In all cases, I decided to abuse a bit the two girls that had taken me there and required that they show me a nice typical restaurant in the area, but made sure that this time, the prices were reasonable. The whole experience made them really uncomfortable. Serves them right. The Chinese consulate wanted me to provide them with a detailed planning of my time here so originally, I had allotted a full week in Shanghai and another one in Beijing. I knew very well that plan would not hold. Two French (one had made it’s way here on his bicycle) I met told me they were moving down to the region around Guilin, famous for its amazing landscapes of Karst formations. After gazing at the pictures of scenery in my Lonely Planet guidebook, I needed no more convincing. 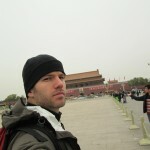 My North Korean adventure required me to arrive in Beijing on the 23rd, but upon returning to China, I knew I would have enough time to visit the capital so I decided to postpone my visiting and follow the other two to the south. No Chinese adventure is complete without a proper train-ride. Spending 22 hours in the seater class would have amounted to madness, so I opted for a bed in the “hard sleeper” class. 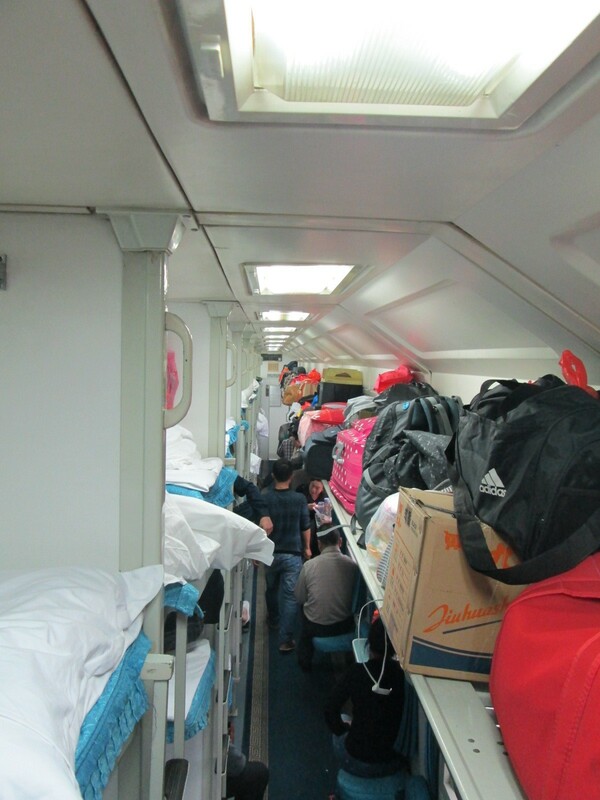 A bed I said, but nothing to do with the cozy cabins we normally picture in overnight trains, here it’s small compartments three levels high by two wide and there are not much seating space besides a handful of folding seats and the lower level beds. Thankfully, I had two french companions but all throughout the ride we bathed in Chinese culture with no privacy whatsoever. Children crying, overcrowding, loud laughters, lots of eating of peculiar snacks, smoking and spitting and to crown it all, a convict (accompanied by two guards) was occupying the upper bed, chained to to the bed post. Him only was responsible for much of the disturbance in the area and by the looks the locals gave him, even they thought he was obnoxious. 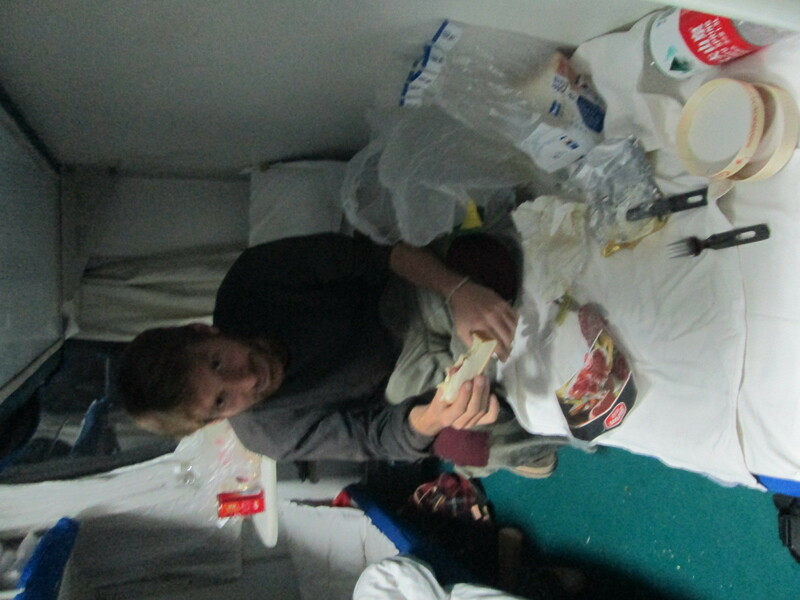 Just to make sure the culture clash was not only going to be on their favor, the two French had bought camembert and blue cheese they had bought at an expat store in Beijing, which after a couple days of getting lugged around in their backpacks, was smelly as hell. The looks on our neigbour’s fase was priceless as she perplexedly watched us eating what seemed to her a concentrated paste of rotten food. Fair enough, she had been gnawing at chicken feet (not legs, feet) for the last hour but not so surprisingly, she turned away my offer when I presented her with some blue cheese on a piece of bread. 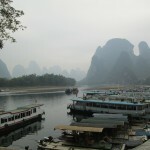 Postcard China: rice terraces and cities built amongst karst peaks, at last some natural beauty. 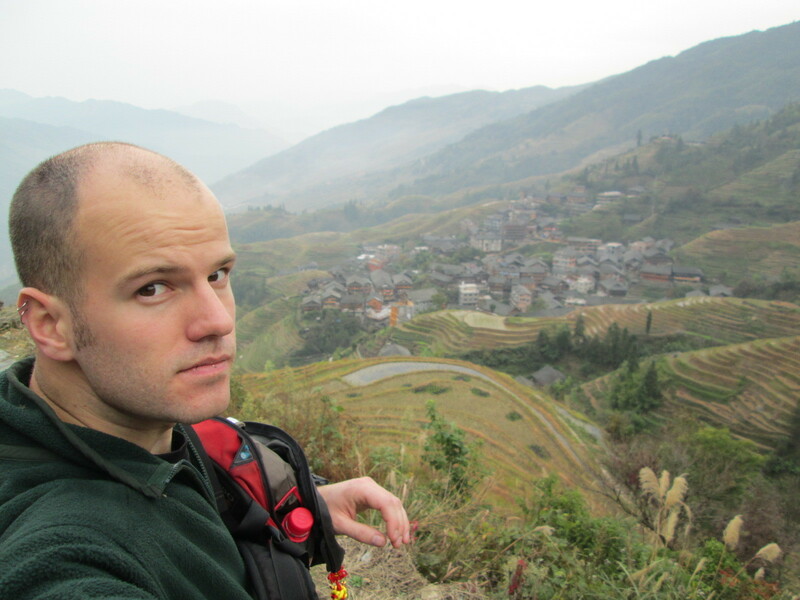 After a quick tour of Guilin, I packed my daypack with all the necessities and headed to the Dragon’s backbone rice terraces with the intention of hiking from the village of Dazhai to Ping’an and spending the night there. 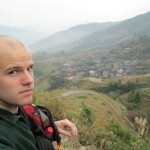 Walking up and down the rice terraces all by myself was the alone time I finally needed (a rare commodity in China). Finding my way was not so obvious since it looks like most of the signs marking the trail were taken down, but eventually, I arrived at destination. Upon entering a restaurant for dinner, I got invited by an older German couple to sit at their table and at the end of the meal, found me entertaining enough to pay for my food. 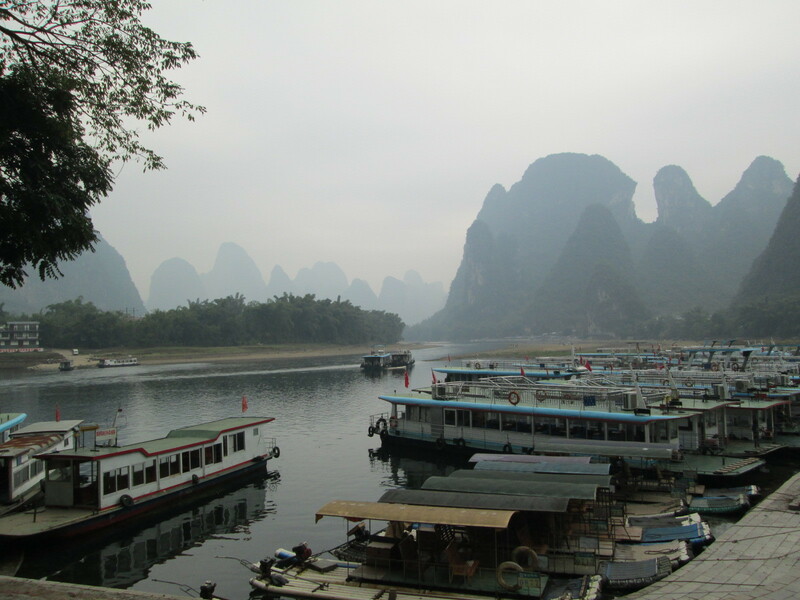 The following day, I grabbed my bigger backpack at the hostel where I had left it and moved to Yangshuo, the tourism hub of the region. On the next day, I decided to join a couple of Chinese to Xinping, a village north of Yangshuo apparently very pretty and where it’s possible to do some hiking. 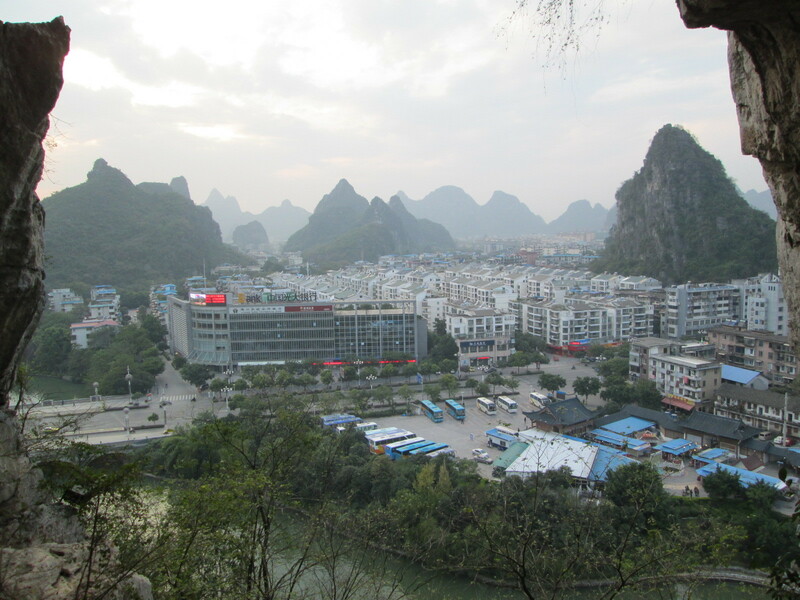 The couple of hours I spent there walking around and climbing a peak made me realize that while Yangshuo labeled itself as a peaceful and quiet outdoor oriented town, it was way too large and developed to ever pretend at that. So I went back, grabbed my stuff and moved to Xingping. 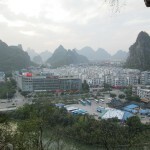 I was not too pleased with the crowd at my hostel in Yangshuo as they were mostly Chinese. Not that I have anything against them, but them being quite shy and the fact that they speak little to no English makes interacting with them really hard. At the hostel in Xingping were some Mexicans that I had crossed paths with in the rice terraces and other westerners with whom it was easier to have a good time. Anyway, what I did most there was hike around the beautiful scenery. At one point I even ended up in a monastery built at the bottom of a karst peak where a little simple-minded resident monk showed me their Bhuddah shrine inside a massive cave for a very small fee. After two nights in Xingping and glad I diverted my travel plans to come to this region, I went back to Guilin to catch my train to Beijing. Following a grueling 24 hours train-ride, I arrived in the colder capital of China, a brutal change from the 20C plus temperatures of Guilin. The journey was not as bad as I had expected it. My Chinese neighbors were quite interested in my weird looks and behaviors and even offered me chicken feet and a glass of some unknown liquor as tokens of friendship that I both dutifully ate and drank. The thing on me that most struck their attention was my old iPod which, judging by their interest in it, appeared to them as the next generation gadget their (already more advanced) touch-screen cell-phones would evolve towards. Anyway, I just had two days to kill before I had to leave for North Korea, so I decided to leave the main sights (the Great Wall and the Forbidden City) for afterwards. I walked around, took a stroll on Tiananmen square and checked out the National Museum of China (which it turns is all propaganda). YPT tours, the company that would take me to the DPRK, had organised a night out at an upscale Beijing club where for a comparatively small amount of money we had access to a very generous table-service of sparking wine and vodka. It was quite an experience to hangout around the city’s elite. Or should I say, the city’s elite’s kids, given the age of most of the customers there. Regardless, the light and dance (some employees were paid to dance) shows were impressive enough to warrant the damage to my hearing. I also got to meet my co-travelers and more specifically Jean-Michel, a Frenchman with whom, given we spoke the same language, I would hang around with the most for the coming week. 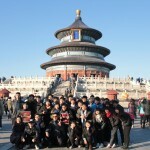 The next day and with a slight hangover, I made my way to the pre-tour briefing and afterwards, me and my new friend went visiting the Temple of Heaven park. Was it not for the November cold, this place would have really lived-up to its name but nonetheless was a beautiful setting to walk around, and so much walking around we did that we both decided that we deserved a treat for supper: Peking duck at a restaurant. Fast forward a couple days and I’m back on a Chinese train, exiting North Korea through Dandong. Not so bad this time, as a chunk of the tour group was there to keep me company, along with a Chinese female basketball team, who – most of them being taller than me – had eyes only for Rowan, a YPT guide that easily took a head on me. Anyway, not a whole lot more happened The constant drinking and partying in North Korea had gotten the best of me and had left my body severely incapacitated with a cold that would endure for the coming week. However, In the evening, I managed to muster the energy to go for a couple beers with some people that had been on my tour. 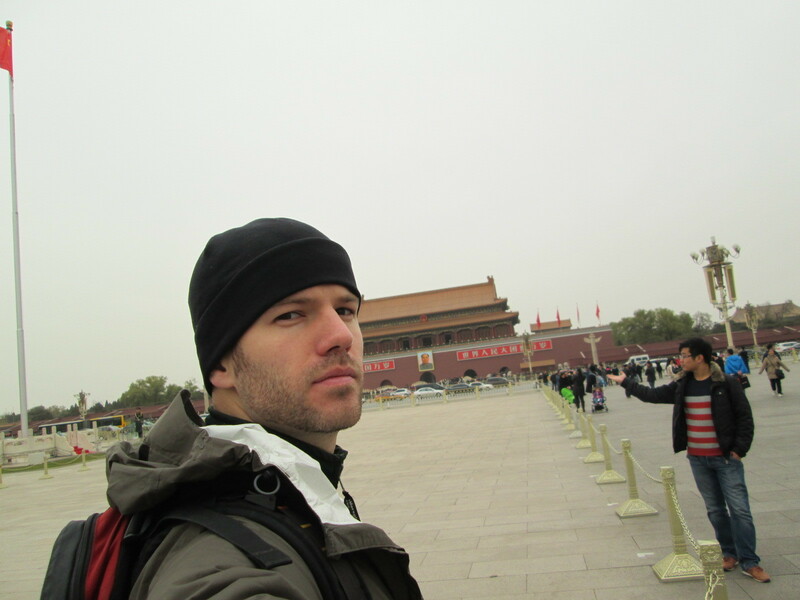 The next day I met up with Jean-Michel for a tour of the Forbidden City, which ended up to be just an oversized version of temples complexes found everywhere in China; had to check that off the list, but overall a big disappointment. Feeling even sicker the next day, I took it easy because the following morning, I had to go check out the Great Wall because no visit to Beijing would be complete without seeing it. 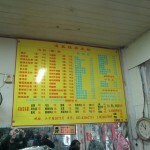 Every tourism agency runs tours to the Great Wall. They are pretty expensive and mostly take you to renovated sections of this monument. The Chinese, true to their habit of turning anything authentic into fake copies, have entirely rebuilt some sections, installed chairlifts and allowed the souvenirs shops to spread around like weed. But the Great Wall, as its name implies, is great (in length, though not visible from space) and extends in many separate sections for hundreds of kilometers, so most of it still sits in its original, dilapidated state. 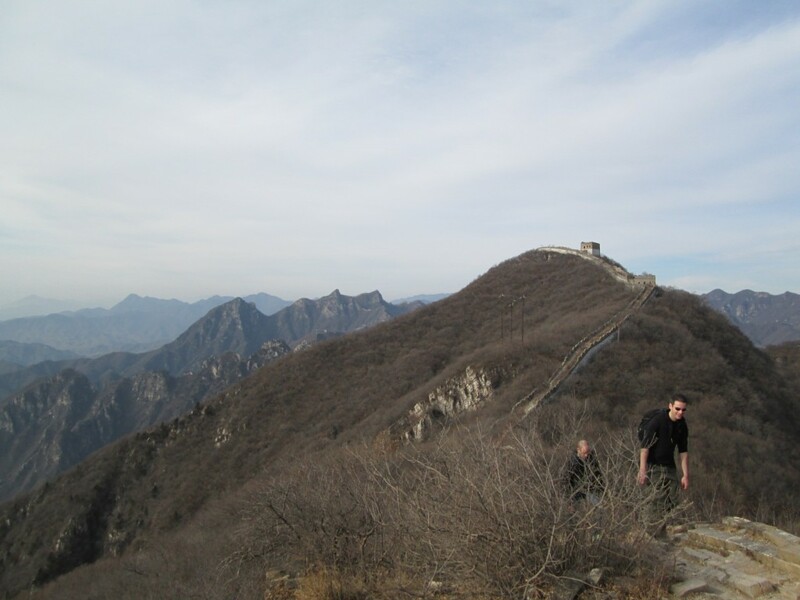 Getting to it requires a bit of hiking but since the wall serpents on ridges, its always in view, you can’t get lost. So I decided to go on my own, took a cab to small village and started walking up to the wall and once I reached it, was rewarded with the already gorgeous view normally found atop mountains but as an extra, the wall stretching in both directions, following ridges and crossing valleys. I could not have wished for something more picturesque. An hour of walking east and the section of the wall that I was on soon linked up to a renovated stretch with all its touristic amenities, including the bus that would take me back to the capital. I met up with my French friend again in Beijing for some snacks at the Dong Hua Men Night Market. Some special snacks indeed, centipedes, larvae of all sorts, scorpions, grass hoppers, sea worms, kidneys, testicles, penises, the list goes on. 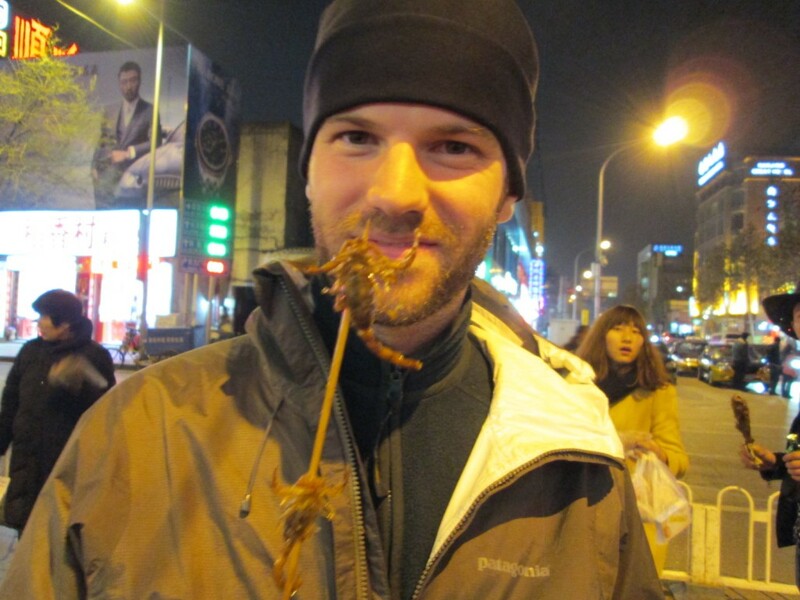 We decided to go conservative and try some beetles (crispy) and scorpions (crispy as well but with chewy insides). Not something we would both eat everyday, which is why we wanted to go together. To have a witness of this edible exploit and someone to motivate the other into eating strange stuff. The wall being the last item I needed to cross off my list, the time came to move on with my travels: to South Korea by boat. Train ride out of Beijing, a quick night in Qingdao (which was nothing worth writing about (also probably the worst hostel night I have ever had)) and I found myself aboard a ferry on my way to Incheon. 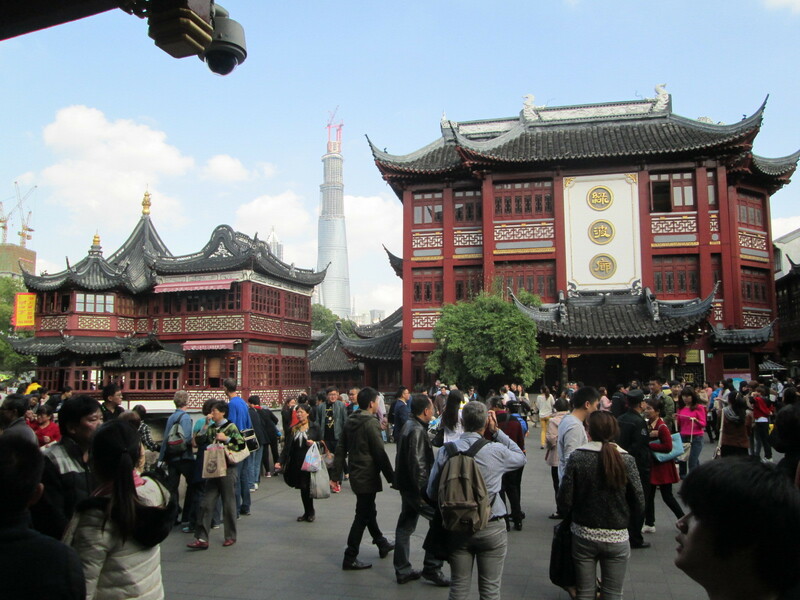 In China, everything happens on a larger scale. Buildings are higher and more numerous. Trains are faster and bigger. Crowds are larger and denser. It truly is, a world of its own, with challenges to your habits and perceptions waiting around every corner. China is evolving at a frantic pace, where progress is dictated by large scale economics and government policy, seemingly unabated by traditions. 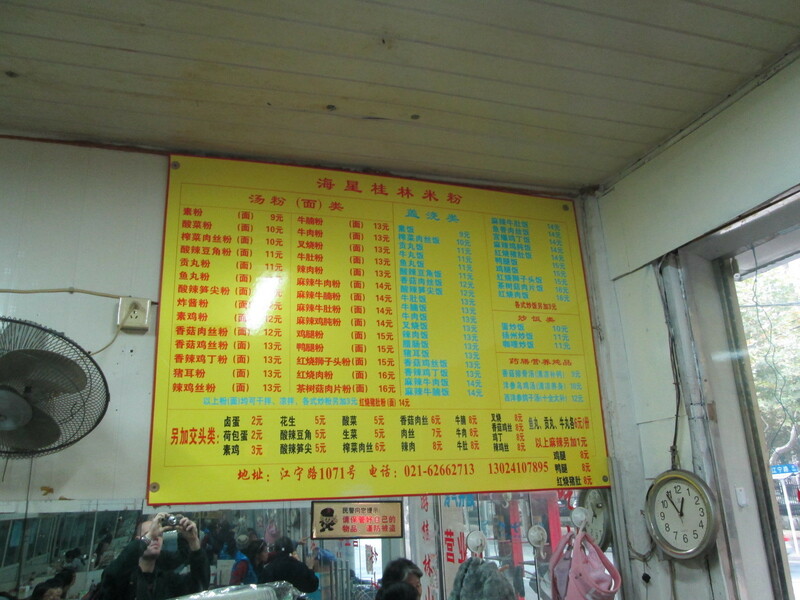 With screens everywhere, big or small, in many regards China feels futuristic. Yet, in between large modern concrete and metal towers, the Chinese live their culture split between different eras, where a cell-phone shop neighbours one selling supertitious items. Where whole blocks gather at a few small kitchens for the evening meal besides a Starbucks. It is a country of contrasts where sadly, it often seems like time has not been alowed to take its due course and things have been pressed on to take shape faster than they should have. Shanghai, certainly the business hub of China, is mostly soulless and bland, whith high-rise buildings of dubious design and endless streets of fashion stores. Making a profit, rather than culture and history, are what matters. Beijing has done a better job at safeguarding its historical assets, but in between, charming hutongs (old style houses) are being demolished every day to make way for malls and apartments. Sometimes, it’s painful to come to the realization that no one will be spared by consumerism. The pace of life is dizzying and the scale of urbanization is mind-boggling. China will not be everyone’s idea of a vacation I’ll admit, but if anything, it should at least be given a chance for the variety and originality of its cuisine. Nothing at all to do with the ubiquitous all-you-can eat buffet, many unseasoned westerners would shy away from most of what’s available here, but with even a small interest of trying new things you should be rewarded with a different dish every meal. At least that has been that case so far for me. In my opinion, this is where the cultural divide between us and them is at its most striking: the vegetables, the fruits, the meat, the snacks, the recipes; everything is different (and eaten with chopsticks). China is large and multi-faceted. I was well aware of that when I first set foot in it, but reading my Lonely Planet guide and talking to other tourists ended up convincing me that I would have to come back, probably for eastern China and Mongolia, which from what I’ve heard, is culturally as far from the frantic west coast as it is distant on the Chinese map. The only thing that can become a handful are the Chinese themselves, They are loud, they spit constantly and blatantly, they are disrespectful and in restaurants its a guaranteed concert of slurping and chewing sounds, let alone the smoking. I’ll blame that on cultural differences, take the spitting for example: we expel microbe-filled mucus in tissues that we put right back in our pockets, whereas they expel them on the surface that people are the least likely to come in direct contact with: the floor. Differing conceptions, but for a society where everyone is given a much more reduced personal bubble than in ours, I would have expected better manners. Otherwise, China is amazing (but demanding). And if ever you want to come about and visit, please avoid the tours, you’ll miss the most interesting. 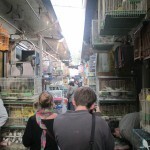 The little restaurants, the markets, the labyrinth like old towns, the small monk wanting to show you around his temple. To my surprise, the Chinese travel a lot around their own country, so most things of interest will be tourism oriented, with plenty of hotels, hostels and restaurants to suit every taste. And I’ve never felt more safe there than anywhere in the world, not even at home. The Chinese don’t steal. They will leave their scooter running while getting something in a store without a second thought. You’ll see women and children walking around in even the darkest back alleys and I’ve even heard of someone forgetting their passport for full-day on a bench in a changing room and it was still there when she came back. As long as you look both ways when crossing the streets, the worst that could happen is an overly spicy soup. Que tu écis baeucoup! Je n’ai pas tout lu ton texte sur la Chine ni sur la Corée. Ceopendant ce que j’ai lu m’as plus : bien écrit dans un style jounalistique. J’aurait apprécié des textes en français… mais ça c’est une autre histoire de famille. 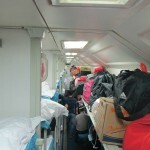 No Chinese adventure is complete without a proper 20 hour HARD SEAT train-ride! Tes récits sont tellement intéressants, Antoine!